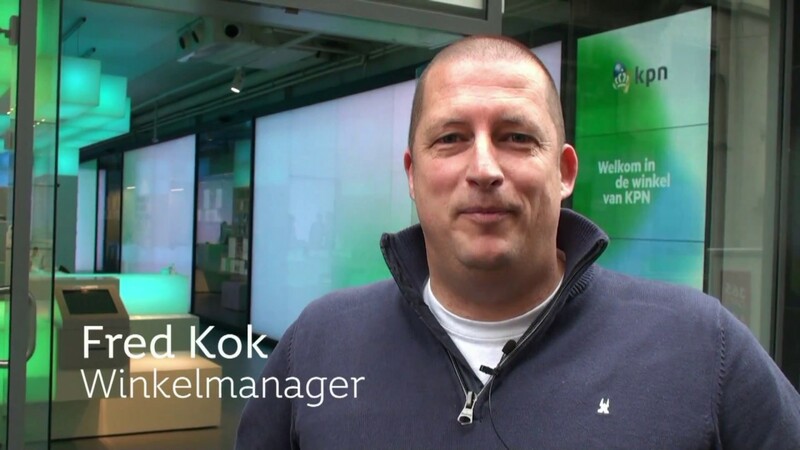 KPN Smart Wall | Elements Interactive — We build applications! For KPN Retail we developed a software solution for their new Smart Wall concept to use in their retail stores all over the Netherlands. KPN is currently in the process of converting their retail stores to a new concept where life-size video walls consisting of giant 55″ touch screens (together up to 5.5 meters diagonally) can be used by store visitors to lookup information. There will be small (1 wall), medium (2 walls) and large (4 walls) stores. In a few cities these new stores already existed, but until now visitors have not been using the smart walls optimally yet to try out products and find information independently, because the content was limited. In 2016 KPN has setup a Scrum team consisting of a consultant, designer and front-end developer from Elements, to improve the smart wall user experience, make the content on the walls more attractive and to add more content. A whole new navigation system has been implemented, based on large “tiles” that invite visitors to tap them. On a second screen, additional tiles are displayed the user can tap that are relevant to the context. The design also got rid of old-fashioned “scrolling” of content and replaced the old, distracting screensaver video with more calm images. Microsoft Kinect technology was added to the screens to detect if a visitor is nearby in the store to interactively open content on the smart wall. In the old situation the visitor had to actively tap on a button themselves first. The content can be viewed on two different heights, based on the actual height of the visitor. The Kinect measures the height of the person and determines the optimal viewing height the content should be displayed. This information is passed on to the smart wall software. Additionally, the newly implemented generic product selector enables users to select mobile phones and tables, corresponding (data) plans, SIM only subscriptions, bundle discounts and phone insurances. For the first release we also implemented a NU.nl news feed, a teaser videos of KPN’s drama series and a SmartLife information page. Meanwhile we work on enhancing and extending the Smart Wall content and product selector even further and work on improving the interaction of the Smart Wall and the hardware in the stores.